There's a 2 for £10 offer on some of the bigger easter eggs at Tesco. I noticed this morning that many of them are £6 but the £8 Ferrero Rocher eggs are included too. Shame these don't come with the mini Ferrero eggs instead of (or as well as) Rocher - the hazelnut eggs are better than Ferrero Rocher (cocoa ones not so much)! Popped down to my local Tesco Express to get these. Success, thanks for posting. Shame these don't come with the mini Ferrero eggs instead of (or as well …Shame these don't come with the mini Ferrero eggs instead of (or as well as) Rocher - the hazelnut eggs are better than Ferrero Rocher (cocoa ones not so much)! Wait until after Easer! They'll be cheaper then ! Does chocolate in a specific shape change its flavour? If not, then just get a bar and be done with it. Does chocolate in a specific shape change its flavour?If not, then just …Does chocolate in a specific shape change its flavour?If not, then just get a bar and be done with it. Where can I buy a bar of Ferrero Rocher from? Thanks Op. Still in stock at my local metro. Heat, but as is the way with a company like Tesco, the offer is misleading. On the shelf at my local Tesco, the 2 for £10 eggs are all together. However, at the till, I noticed a high bill. This is because the Ferrero eggs can't be mixed with the others. The Tesco store manager putting eggs out when I went back to check treated me like I was stupid for not realising, but the price label doesn't say anything about only applying to Ferrero. I would bet many rushing in to pick up some eggs on their way home from work have fallen into this little trap. "Marketing communications must not mislead the consumer by omitting material information." Tesco are misleading customers on this promotion. 1) check your receipt to see if you paid more than £10 for the two Easter eggs. Take a photo of this receipt and save it to your computer or phone. "The terms for the 2 for £10 discount on Easter eggs are not clearly stated. 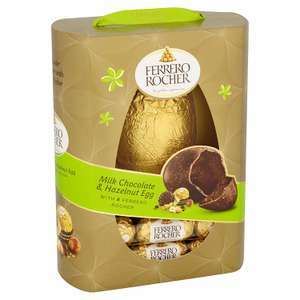 Ferrero Richer eggs, and other brands of eggs, are marked as '2 for £10' in store. All Easter eggs all located in the same area of shelving. However, there is no clear statement that informs customers the Ferrero Richer eggs cannot be purchased with other brands to receive this discount. The pricing information provided is therefore misleading and unclear, and Tesco are in breach of the Advertising Standards Agency rules." (Or any other wording you prefer, this is just what I sent to them so thought I would share). Don't forget to attach the photo of the receipt as proof. 3) Hopefully Tesco own up to their mistake and offer you a refund for the amount charged over £10 + some vouchers to apologise. However, if Tesco fob you off (as I was fobbed off when I raised it in-store with the Tesco manager), Resolver will let you escalate the matter to a company director at Tesco at the click of a button. Heat, but as is the way with a company like Tesco, the offer is …Heat, but as is the way with a company like Tesco, the offer is misleading.On the shelf at my local Tesco, the 2 for £10 eggs are all together. However, at the till, I noticed a high bill. This is because the Ferrero eggs can't be mixed with the others.The Tesco store manager putting eggs out when I went back to check treated me like I was stupid for not realising, but the price label doesn't say anything about only applying to Ferrero.I would bet many rushing in to pick up some eggs on their way home from work have fallen into this little trap.The Advertising Standards Agency states:"Marketing communications must not mislead the consumer by omitting material information." https://www.asa.org.uk/type/non_broadcast/code_section/03.htmlTesco are misleading customers on this promotion.So, if you have 5 minutes, and bought a Ferrero and a different egg in the 2 for £10 deal:1) check your receipt to see if you paid more than £10 for the two Easter eggs. Take a photo of this receipt and save it to your computer or phone.2) write to Tesco using the free MSE-backed website Resolver (https://www.resolver.co.uk) and state:"The terms for the 2 for £10 discount on Easter eggs are not clearly stated. 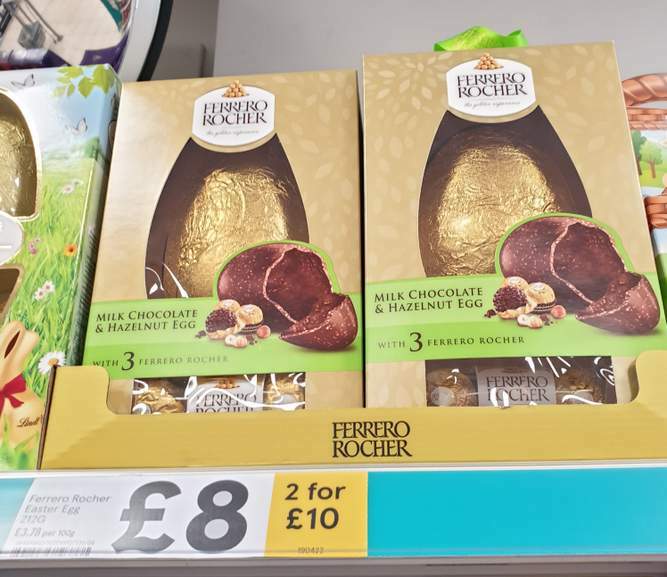 Ferrero Richer eggs, and other brands of eggs, are marked as '2 for £10' in store.All Easter eggs all located in the same area of shelving.The Advertising Standards Agency states:"Marketing communications must not mislead the consumer by omitting material information." https://www.asa.org.uk/type/non_broadcast/code_section/03.htmlHowever, there is no clear statement that informs customers the Ferrero Richer eggs cannot be purchased with other brands to receive this discount.The pricing information provided is therefore misleading and unclear, and Tesco are in breach of the Advertising Standards Agency rules. "(Or any other wording you prefer, this is just what I sent to them so thought I would share).Don't forget to attach the photo of the receipt as proof.3) Hopefully Tesco own up to their mistake and offer you a refund for the amount charged over £10 + some vouchers to apologise. However, if Tesco fob you off (as I was fobbed off when I raised it in-store with the Tesco manager), Resolver will let you escalate the matter to a company director at Tesco at the click of a button. I had the same issue, tried to purchase a £6 egg and an £8 one. When I queried the price I was told you can't mix the two prices. The member of staff also acted like it was obvious and I was an idiot.